Prepare your students for STATE ASSESSMENTS. But it's MORE than just test prep. It's GOOD writing. Or ADD a bit more and FOCUS on making strong CLAIMS and writing compelling PARAGRAPHS. 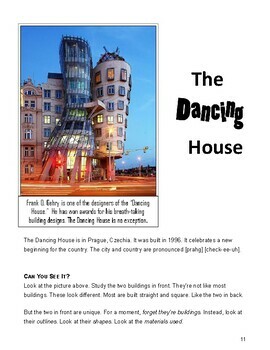 "THE DANCING HOUSE" is a NONFICTION ARTICLE about architect, Frank O. Gehry. He has designed award-winning, often metal-skinned buildings around the world, including the Guggenheim Museum in Spain. The "Dancing House" was designed to celebrate the beginning of democracy in Prague, Czechia in the 1990's. These materials strongly support READING and WRITING skills. 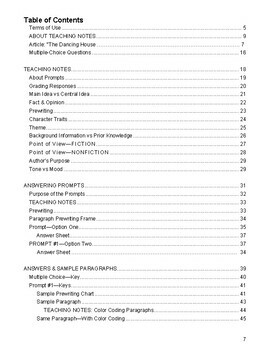 This article has multiple choice questions, a WRITING PROMPT and SAMPLE PARAGRAPH RESPONSE. Students use information from the TEXT to answer questions. get ADDITIONAL PRACTICE organizing and COMMUNICATING their thoughts. Use texts MULTIPLE times to teach NEW concepts, as well. 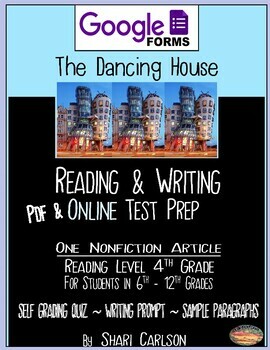 WANT JUST ONE GOOGLE FORM FOR ONLINE TEST PREP?